Today the Ministry of Defence denied that any "accommodation" had been made with the notorious al-Mahdi militia which prevented the British Army from supporting the Iraqi and American armies in a recent assault in the Middle East. "We simply agreed that our troops in Afghanistan would not move into the Middle East," explained General Bill Billington-Billingsworth from his office in Whitehall. "We would stay out as long as the Mahdi held position in Alberta and did not threaten our positions in the Western United States or indeed Brazil from their stronghold in North Africa." Everything, said the General, would have been fine until the Iraqi team, frustrated by what they perceived to be a lack of support from General Billington-Billingsworth’s troops, launched an attack into the Middle East from what appeared to be a weak position in India. "It seems that they did this without discussing it with the team from America who had nipped out to get some more beers from the fridge and returned to find their forces in the Ukraine under attack from the al-Mahdi’s," said Billington-Billingsworth discussing their week long Risk marathon. 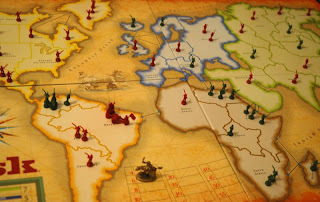 The event had gone well, although whilst everyone had been focussed on the planned marathon session of the strategy board game Risk, the Iraqi and British teams had left it to the Americans to determine follow-up arrangements. "It was assumed that there would at least be a couple of rounds of Diplomacy, said General Billington-Billingsworth. "However even though the Americans had forgotten to bring their board, the real problem was that there was no one around to tidy up the mess from a week’s drinking and munching on crisps and takeaways before my wife returned form visiting her mother." It was this let down that led to some bad feeling and marred the otherwise enjoyable games session that may mean that the old university chums might not get together for some time. "I am sure we will all remain friends, but I guess that’s why its just a bit of fun - you couldn’t run a real war like that could you?" asked Billington-Billingsworth. "Imagine how bad Iraq would have been if the yanks there had just focussed on the high-profile game completely forgotten about diplomacy and the aftermath of all the action? Oh I see."